A fully automated hospital bed and transport robot. In the future world portrayed in this anime film, Japan explores the use of robotic systems that provide complete care to the elderly. The Roujin Z system provides care to fully bedridden patients. From Roujin Z, by Katsuhiro Otomo. 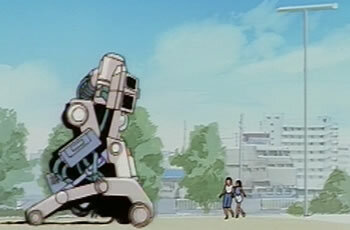 Student nurse Haruko becomes concerned that the robot is not providing quality care to her elderly charge. Despite the fact that the system provides fully integrated monitoring and care, the robot seems to have a military mind and purpose of its own. - Military Tech Inside Your Roomba?